Our Ready to Ship styles are handpicked from the largest selection of moissanite and morganite gemstones in the Los Angeles Jewelry District at Icing On The Ring. Choose from any of our pre-set moissanite or morganite engagement rings online here, or schedule your visit to view your options in our LA showroom today! Mesmeric moissanites are the preferred and recommended gemstone alternative offered at Icing On The Ring. From a wide variety of center gemstones, moissanites are the utmost popular choice due to their light-refracting tendencies and glimmering planes. With the largest selection of flawless moissanites available in the Los Angeles Jewelry District, these glorious gemstones are also available for online purchase in our Pre-Set Moissanite engagement ring category. Let your engagement ring speak for itself with your effervescent moissanite reflecting all the vibrant colors of the rainbow. What is a moissanite? Discovered in Arizona in 1893, Moissanites have become the prime dominant gemstone due to the rarity of Earth’s natural production of the gemstone. Composed of silicon carbide, the moissanite is incredibly durable in design and incorporates a lucid clarity unmatched by neighboring competitive jewels. Charles and Colvard, our suppliers here at Icing On The Ring, have procured an unbelievable trade of perfecting the exceptional moissanite. 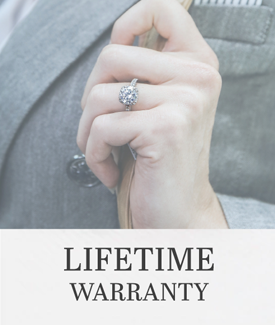 Guaranteed with a lifetime warranty, the reputable Charles and Colvard ranks most high on a scale accounting for brilliance, fire dispersion, hardness, and the tough durability of their moissanites. Taking into consideration ethically and environmentally conscious jewelry, Icing On The Ring has high regards in the manufacturing of moissanites. The value of being socially conscious in the midst of jewelry creation is a trait esteemed at our institution. These colorless moissanites can be fashioned into a shade of your liking onto various metal foundations such as rose gold, white gold, platinum, and yellow gold. The glass-like icy brilliance of the gemstone can be remarkably displayed on a variety of precious metals. The possibilities are endless with your scintillating forever moissanite.